This is the month of comfort foods for me. 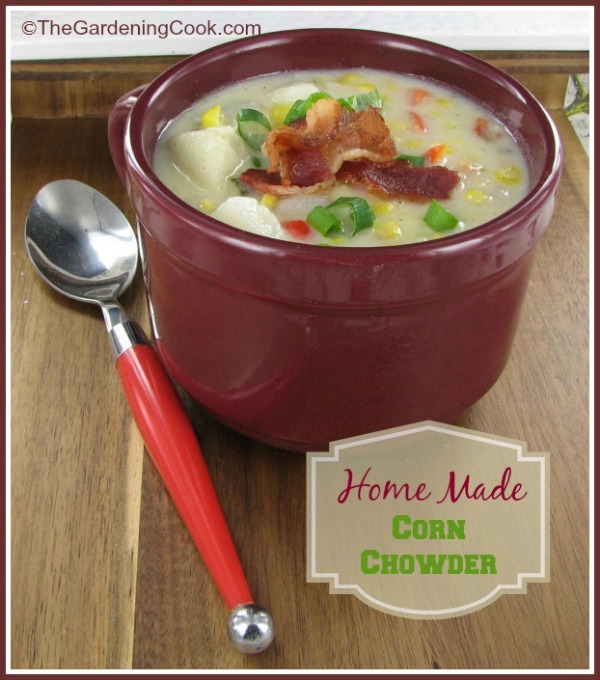 Rich, hearty dishes like this home made corn chowder seem to hit the spot perfectly when the weather is cold and the days are short. This recipe is lovely and creamy. 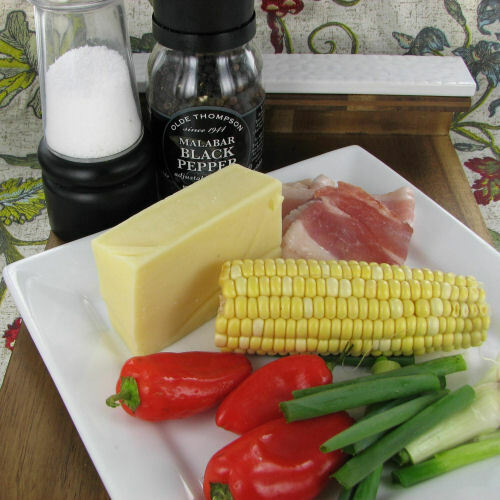 It can even be a meal by itself since it is very filling because it has both potato and corn in the ingredients. Plus, the Greek yoghurt and cheddar cheese give it a velvety and rich texture. I am lucky enough to have spring onions still growing in my garden, so into the pot they went, and were also used as a garnish, along with the bacon, which I baked in the oven, to keep down the fat content of the soup. Aren’t the colors gorgeous? I feel like diving head first into the frying pan and not coming out until they are devoured. Oh, wait…. the chowder…mustn’t forget I am making a chowder! Serve a big bowl of it it with some crusty bread for a satisfying meal on its own, or a smaller cup of it with a side dish like my French bread pizzas recipe. Either way, it will fill the empty stomachs on cold winter nights. 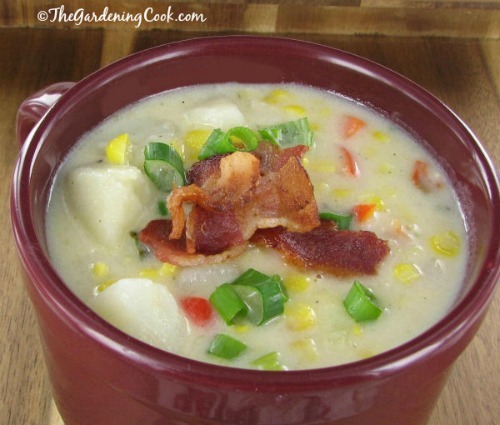 Rich, hearty dishes like this home made corn chowder seem to hit the spot perfectly when the weather is cold and the days are short. Preheat the oven to 400º F, and cook the bacon on a rack for about 10 minutes until done. Remove and place on paper towels. When cool, crumble and set aside. Place the potatoes in a saucepan over medium heat. Add water and a bit of salt just to cover and cook until the potatoes are fork tender. Drain and reserve 1 cup of potatoes and mash them. 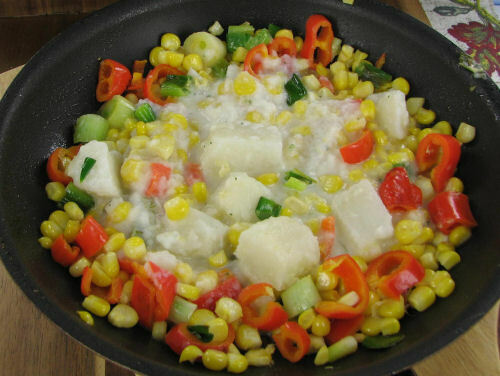 Stir the mashed potatoes back into the remaining potatoes in a saucepan, along with vegetable broth, crushed garlic, salt, pepper, corn and red bell pepper. Cook over medium heat 5 minutes, stirring occasionally. In small bowl, mix the flour into the milk and whisk until well combined; stir into the potato mixture. Cook over medium heat, stirring frequently, until mixture thickens and boils. Stir in cheese until it has melted. Remove the mixture from the heat; stir in the Greek yogurt, cilantro and chopped green onions. 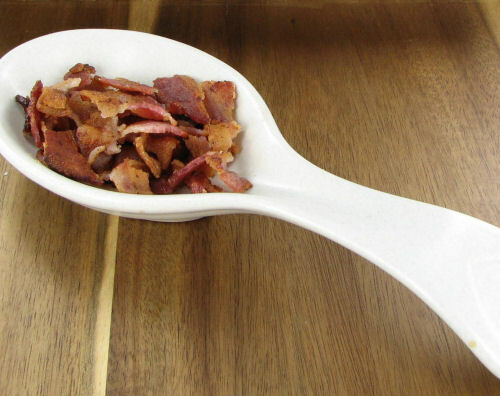 Garnish with the crumbled bacon and serve.